During my Christmas post series you have met different travel bloggers but today you will meet a traveler who is also an awesome baker. Cate loves to explore local culture and when she is not traveling she makes travel inspired desserts. For all your sweet cravings and Germany related queries you can head to her International Desserts Blog.Today she is sharing her experience of celebrating Christmas in Munich. 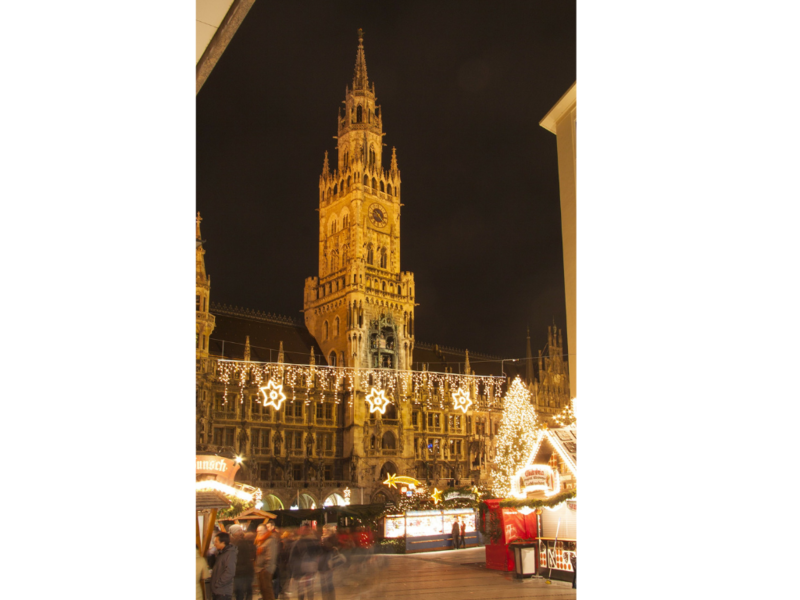 Munich is a beautiful city to visit any time of year but especially for Christmas! Located in Bavaria in southern Germany, Munich offers a plethora of activities, as well as numerous day trip options. You definitely won’t get bored in Munich. To get into the Christmas spirit, be sure to visit Munich’s Christkindl Market in the downtown Marienplatz (there are multiple Christmas Markets around Munich, not to mention one in nearly every single German city, most are open through December 24). Do as the Germans do: eat a Bratwurst, drink at least one mug of piping hot Glühwein (mulled wine), and savor a packet of warm Gebrannte Mandeln (cinnamon sugar almonds)! If you’re interested in attending a Christmas service, there are plenty of beautiful churches and cathedrals to choose from. You can also enjoy a free Christmas concert in the Frauenkirche, go ice skating in Karlsplatz or visit the Tollwood Winter Festival located on the Oktoberfest grounds. If you like sweets, I highly recommend visiting any grocery store and stocking up on a variety of German Christmas treats, such as chocolate, Lebkuchen, Dominosteine, and more. Beside christmas market go for a stroll in the Englischer Garten (especially fun when it snows), bundle up and sip a hot coffee at an outdoor cafe, visit a beer hall (the Hofbräuhaus is touristy but fun), tour the Nymphenburg Palace and grounds (I’ve heard that you can sometimes try curling there!) or pop into the many cathedrals downtown and around the city. When you’re ready to explore beyond the city, you have so many day trip options. Salzburg, Austria is a 2-hour train ride away, the Alps are close by, and the Salzwerk (salt mine) near Berchtesgaden is a lot of fun. Tip: it can be very cold in Munich in December so wear warm layers and comfortable shoes.